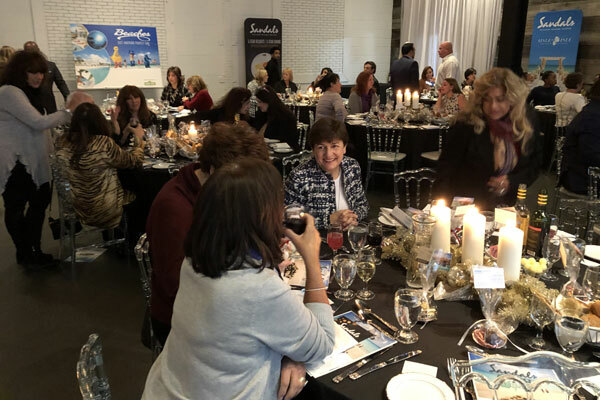 A 14-city series of cross-Canada Travel Agent Appreciation Dinners made a Toronto stop last night (Nov. 22) as Sandals thanked its top travel agent partners and reaffirmed its commitment to the agent community. Sandals hosted 90 Toronto-area agents and several tourism board partners at York Mills Gallery. Agents were treated to a reception, dinner and an update on all that the luxury all-inclusive chain has to offer. One official noted that Sandals’ focus clearly remains on the travel agent and events like last night help differentiate what Sandals has to offer from Brand X. Sandals’ goal is to make agents comfortable with what they’re selling, helping them help their clients make the right vacation choice while earning healthy commissions. “We’re here to say thank you and show you how we’re evolving as a company,” said Maureen Barnes-Smith, director of sales & marketing, Unique Vacations Canada Inc. Brand updates included a look at the newly refurbished flagship Sandals Montego Bay, “it’s really a brand new resort,” said one official; new private, BMW transfers for guests staying in top room categories at Sandals Montego Bay and Sandals Royal Caribbean; and information on the brand’s popular over-the-water bungalows in Jamaica and St. Lucia, ideal for “high-end” clients. “This is not Bora Bora. It is a one-of-a-kind experience, and only four hours away [from Toronto],” said Barnes-Smith. Agents were also updated on Sandals’ newest resort, Sandals Royal Barbados, home of the company’s first rooftop pool and bowling alley. Barnes-Smith also joked that Sandals numerous room categories were created by Chairman Gordon “Butch” Stewart to purposely make it complicated for consumers, prompting them to go to travel agents for help. 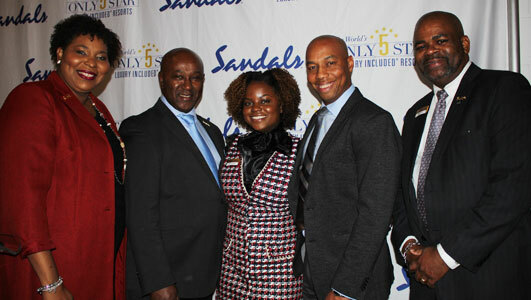 An update was also given on Sandals’ new agent incentive program, Points to Paradise. Pictured at the dinner are (l-r) Barnes-Smith, David Latchimy, general manager, Sandals Negril, Giselle Williams, business development manager, Central Ontario and Ottawa, Unique Vacations Canada Inc., Garth Laird, senior national director of sales, Unique Vacations Inc (based in Miami), and Robert Smith, business development manager, Eastern Ontario, Unique Vacations Canada Inc.